Crews and individuals are working to clear roads and sidewalks. Snow plow drivers were busy from Sunday through to Tuesday morning in the Langleys, with no sign of when their job of clearing major roads would be done. Schools remained closed for the second day on Tuesday, with both students and staff told to stay at home. Most businesses were open, and major routes remained largely clear, though side roads were treacherous in places. Snow removal crews have been working in 12-hour shifts, 24 hours a day since the snow started Sunday. In the Township, with hundreds of kilometres of roads, there are 23 vehicles with plows. They’re also spreading salt or brine to keep the roads clear after they pass, and 10 of the vehicles are dump trucks with the larger plows under the chassis. 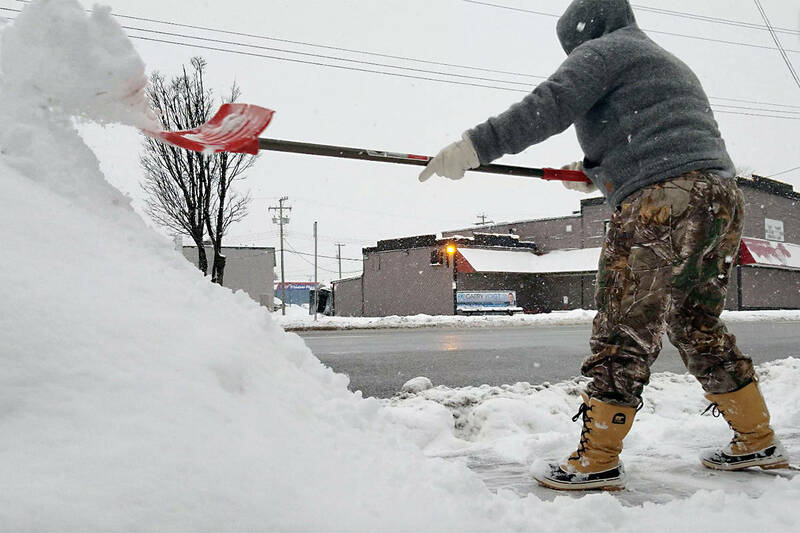 “The amount [of snow] isn’t that bad, it’s the timing,” said Edey. Back-to-back snowfalls gave crews little time, and means they have to keep going back and clearing major routes. In the Township, crews clear primary routes – major highways and commuter routes such as Fraser Highway and 200th Street – and then once those are clear, secondary routes, and finally tertiary routes. Tertiary roads tend to be suburban residential roads. If it stops snowing, it might still take a day to a day and a half to get to secondary roads, and then tertiary. “We’re hoping the sun comes out and melts the snow before we have to go there,” Edey said. Until the snow stops, road crews will be working 12-hour days, as will mechanics to keep the machines running. In Langley City, with its smaller area and road network, crews were doing well keeping up with the snow and keeping most routes clear, according to a City spokesperson. Both arterial and secondary roads were being cleared in the City. Meanwhile, TransLink was warning of slower service due to the snow and ice. HandyDART vans were being sent out with two staffers each instead of one, to help customers navigate from their door to the vehicle.